Kacey Musgraves' style evolution; Coachella weekend No. 2 highlights, interviews and fashions. The man accused of secretly taking tests for high school students to get them better scores pleaded guilty. A former prep school administrator who oversaw college entrance exam preparations has pleaded guilty to taking SAT and ACT exams for students in a nationwide college admissions cheating scandal. Mark Riddell, of Palmetto, Florida, pleaded guilty in Boston federal court Friday to mail fraud and money laundering conspiracy charges. 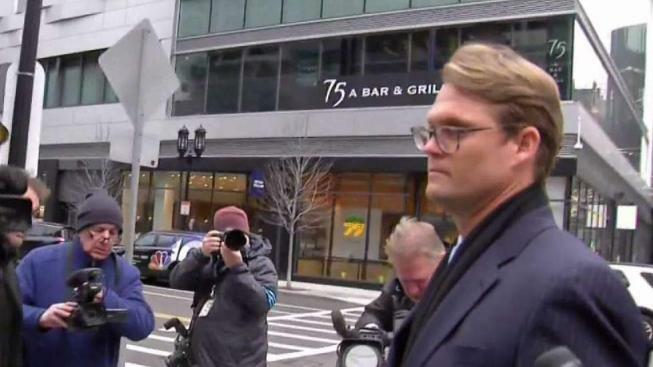 Investigators said between 2012 and February, the 36-year-old Harvard graduate secretly took entrance exams for students or corrected their answers after their test was turned in, according to documents filed in federal court in Boston. He was paid $10,000 per test. In one instance detailed in the indictment, Riddell, who oversaw entrance exam preparations at IMG Academy, allegedly flew from Tampa to Houston to take the ACT exam for a student. The complaint claims Riddell was sent a sample of the student's handwriting so that he could mimic it. The alleged ring leader of the operation, William "Rick" Singer, bribed test administrators to allow Riddell to take the exams in place of students or to replace their responses with his own, according to officials. Riddell faces up to 20 years in prison and a $250,000 fine. He has been cooperating with authorities since February in the hopes of getting a lenient sentence. According to an agreement filed last month, prosecutors are recommending incarceration and a fine at the "low end" of guidelines. Riddell will also have to forfeit almost $240,000 that he earned from the scheme. It will be up to the judge to decide whether to accept the agreement. Sentencing was set for July 18. Riddell apologized for his roll in the scheme in a statement to NBC News last month. "I want to communicate to everyone that I am profoundly sorry for the damage I have done and grief I have caused those as a result of my needless actions," he said in a statement released by his attorney. "I understand how my actions contributed to a loss of trust in the college admissions process. I assume full responsibility for what I have done." IMG Academy, founded by renowned tennis coach Nick Bollettieri, fired Riddell amid the scandal. Riddell graduated from Harvard in 2004 and was a tennis player for the university. Riddell was among 50 people, including Hollywood actresses, a fashion designer, college sports coaches and several CEO’s charged last month in the sweeping bribery scheme dubbed "Varsity Blues."